As some may know, just because something is good for personal use or for one employee does not mean it is good for your business as a whole. Emerson Sync provides an easy way for your business to share and sync important data across multiple platforms, while keeping security a top priority. Keep all of your files with you wherever you go. Emerson Sync updates and protects your work. 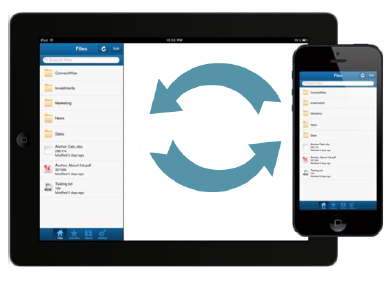 Users can access their files from their laptops, tablets, and smartphones. Emerson Sync empowers users to collaborate on files using Team Shares. Anytime a file changes on a Team Share, everyone will have access to the most up-to-date version. With one click of the mouse, users can share files, set expiration dates, track downloads, receive notifications, and send messages. Emerson Sync tracks all user activity, including additions, deletions, and changes, making it easy to download and restore any deleted files and previous versions. Emerson Sync allows business to cloud-enable their file server, minimizing dependence on FTP and VPN. No more cumbersome technologies. As your trusted IT service provider, we promise to work with you to minimize these risks and support your file access needs: Emerson Sync is the only cloud file sync service that we stand behind and guarantee. Discover how file access can be easy, safe, and secure.